There are also lists for 1900-1 and 1905-6. On the 1900 list the same three Wohlgemuths are listed using first initials only (Isaac is identified as "J. Wohlgemuth".) However, in 1905 there are no Wohlgemuths listed. This is great because it definitively places our ancestor as a merchant in Elbing between the years 1893 and 1901. We also know that Elly was born in Elbing in 1901. It also shows that Isaak no longer resided in Elbing by 1905, which is consistent with the fact that Hilda was born somewhere else (Danzig) in 1906. Whether they remained settled in Danzig or perhaps relocated again (to Konigsberg) is to be determined. The two new Wohlgemuth names, Witwe and Heinrich, are new to us. The name we might have expected to see—Leopold, Isaac's father—is not listed. Is he perhaps deceased by 1893 or else still in Stargard? If so, are Witwe and Heinrich brothers of Isaac? They could also be cousins or similar relation. ( Elbing is only about 30 miles from Stargard although it was across the river in East Prussia.) It is interesting that Witwe and Heinrich are also absent from the 1905 Elbing list, suggesting that they all may have moved together. Welcome home, Jo. This is the second time your traveling investigations have resulted in fantastic discoveries. Here is a better view of the relevant records of three of our Wohlgemuth ancestors in Stargardt. This records the very moment they took on the Wohlgemuth surname as a condition for acquiring legal citizenship in West Prussia. At the time of this action, they were among a small number of Jews from rural areas who established homes and businesses in the town. Without citizenship, they were subject to various punitive measures up to expulsion. Previously, Jewish men were identified by the combination of given names, their own and their father's. So in the first record we see Moses, the son of Salomon, who now adopts Moses Wohlgemuth as his legal name. The next two records have original names identifying them as the sons of Moses, so we see the family tree developing. We know that our great-grandfather Isaak Wohlgemuth was born in this town 53 years after these Wohlgemuth men became citizens. We presume that Isaak's father Leopold was born here but don't have the year or other details of his birth. I am working to establish the connection from Isaak and Leopold backwards to either the Herz or Salomon Wohlgemuth listed. There will be another one or two generations in between. If we establish that our Wohlgemuth family descended from either Herz or Salomon Wohlgemuth, that will further embellish our German citizenship credentials. About the Wohlgemuth name, it translates something like "good natured" and it was probably selected by Moses and his sons from a list of approved surnames. At Virtual Shtetl, there are photos of the destroyed Jewish cemetery of Starogard Gdansk. 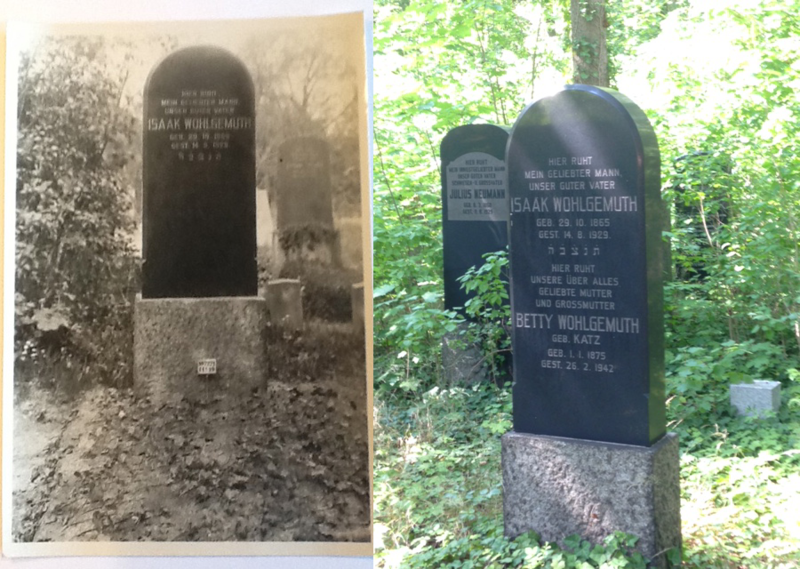 Just a few headstones are intact, but see here the one for a Wohlgemuth woman buried in 1890. She could be an aunt by marriage of Isaac's father Leopold. The Nazis killed very few Jews in Starogard for the simple reason that almost everybody had left the town before 1939. The Jewish population of Starogard peaked at around 600 in 1875, when Isaak was a boy, and then began to decline for economic reasons. We know that Isaak left there for Elbing at a time that many young people were leaving shtetl life for larger cities. There was an atrocity in the fields outside of Starogard, but they were Poles that were gunned down, not Jews. The Nazis occupied the synagogue building after 1939. 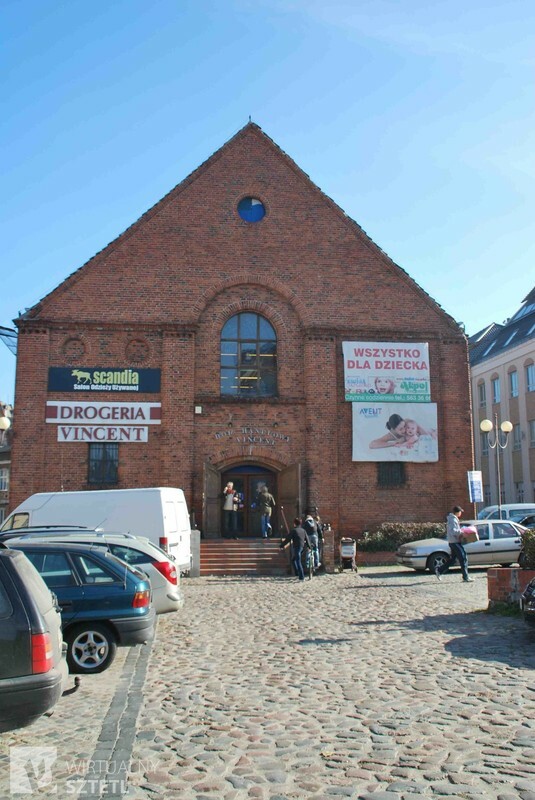 The building is still standing (see the photo), having been used by merchants for many years, but was recently returned to the Jewish Community of Gdansk. Also here is four-minute video shot at the Starogard cemetery. The narration is in Polish but images and music are quite moving. 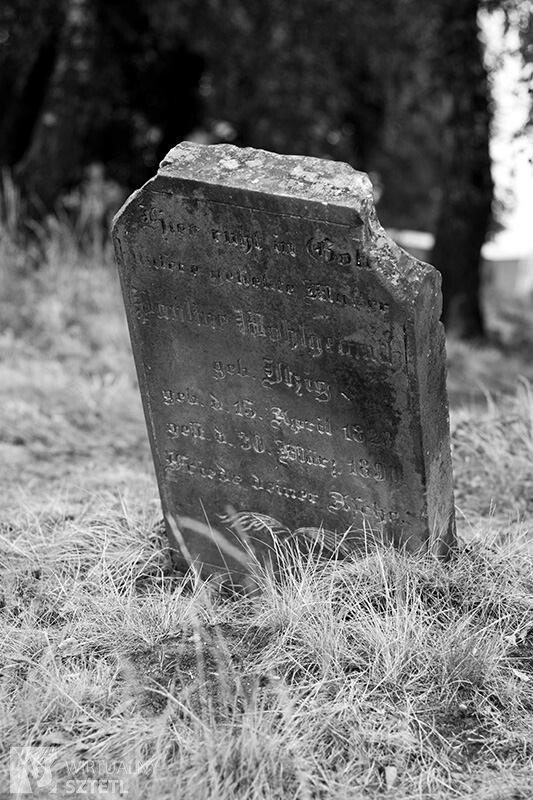 I believe I see another Wohlgemuth headstone in the video. Review what was written here about the Wohlgemuths in April 2012. The second post concerns a West Prussian citizenship law of 1812 that affected the lives of area Jews in important ways. The law made some Jews eligible for Prussian citizenship, giving them legal status and protection from persecution. Among the requirements to qualify, Jewish families were required to take on Western-style surnames instead of the patrilineal naming style that Jews had practiced for centuries. Before the coming of surnames, Jewish men were known by the combination their own name and their father's name. In 2012, I had discovered 10 instances of Wohlgemuths on the 1812 citizenship list. I found they were clustered in towns to the southwest of Danzig and even made a map to show the distribution of towns. Two of the Wohlgemuths on the list, Moses Solomon Wohlgemuth and Herz Moses Wohlgemuth, were from the town of Stargard Gdanski, a sizable town 40 miles south and west of Danzig. Since we have now learned from his marriage certificate that our ancestor Isaak Wohlgemuth was born in Preuss Stargard (in 1865), it seems logical to assume that Isaak and his father Leopold must descend from one of the Wohlgemuths from Stargard on the 1812 list. On the right is the photo Joanne snapped yesterday at Weissensee Cemetery in Berlin. 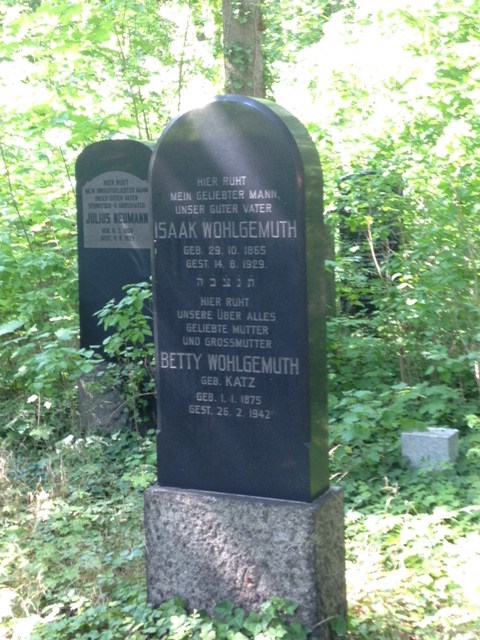 It is the headstone of Helga's grandparents Isaak and Betty Wohlgemuth. Note Betty's death date of February 26, 1942. Also note her maiden name Katz and birth date, which match up with newly available records on Ancestry.com that reveal the Katz family history in the town of Kolberg, West Prussia, and the Wohlgemuth family in Stargardt, West Prussia. 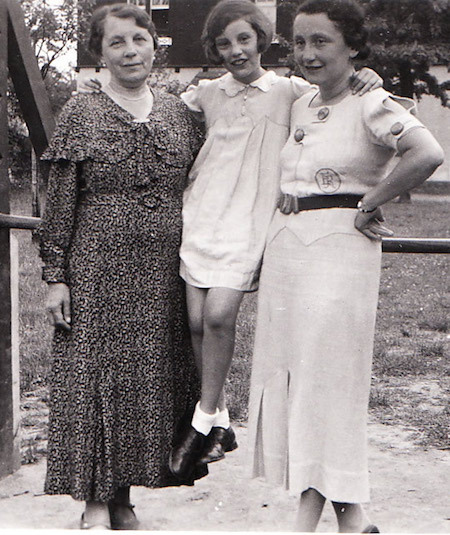 The photo at left is the one carried by Elly Ringel, the daughter of Isaak and Betty, on her journey to America, and thus was made before late August or early September of 1938 when Elly and Helga left Berlin. It shows the same headstone with Isaak's inscription (he died in 1929) but obviously is without the inscription for Betty (since she was still living in 1938). Until yesterday, we had not known Betty's fate after 1940, when we know she was in touch with Elly while she and Helga were refugees in France and Betty sent them the money that enabled them to escape Europe. 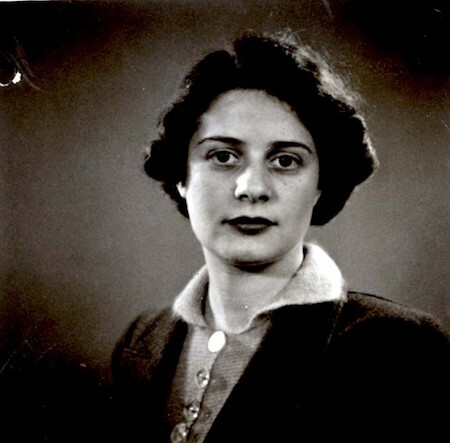 There had been much speculation among the Ruby siblings that Betty had suffered deportation to the camps, perhaps Auschwitz, as did tens of thousands of Jews from Berlin between October 1941 and early 1945. The fact that Betty was apparently laid to rest at Weissensee in February 1942 strongly suggests this is not the case. The surprising history of Weissensee is that the cemeter continued in operation throughout the war. According to an article I read yesterday, there were more than 3200 burials (almost 10 per day) during 1942. This dropped to 931 and 244 in 1943 and 1944. The history suggests that the Nazis allowed Weissensee and also a Berlin Jewish hospital to remain in operation throughout the worst years of Jewish persecution, probably as a public relations ploy to portray the regime as sympathetic to the plight of the local Jewish population. In reality, they began a systematic roundup and deportation of Berlin Jews in October 1941. Betty Wohlgemuth would have been 66 years old at the time. Joanne believes she was living in an upstairs apartment at the Schlüterstrasse 12 address, though I want to review her evidence for that. 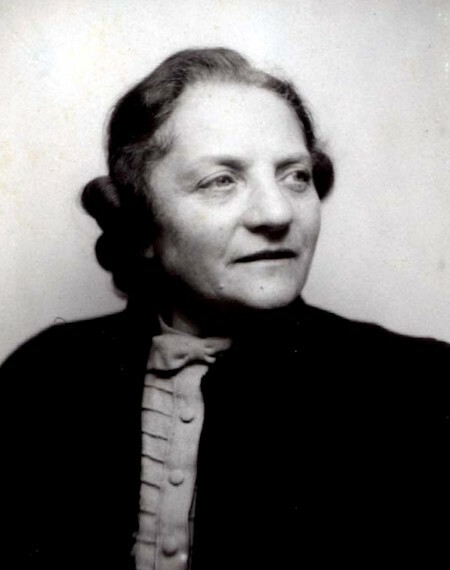 As an older, female, widowed Jew with proven German citizenship (by virtue of her father's birth in West Prussia) she was not included in the early transports of Berlin Jews during 1941. If Betty had been killed in a camp and later a stone was inscribed, I believe there would have been some reference to the place and manner of her death. Since there is not, the more logical explanation is that she died in Berlin and was buried by the still-functioning Jewish community. At this point, we don't know how she died at age 67 in February 1942. Nor do we yet know who arranged and paid for the headstone inscription. Her age and circumstances certainly allow for any number of natural causes. Another possibility is suicide. The article I referenced above says that 811 of the burials in 1942 were suicides, up from 254 in 1941. Presumably the 300 percent increase can be explained by the new deportation orders that went into effect in late 1941. Could our great-grandmother have been among that statistic, or did she die of a natural cause? There may be more we can find out. One more matter to consider here is the cause of our misinformation. Several family members have visited the cemetery before and not seen the Wohlgemuth headstone. This is because the main focus of their visits was the Hermann Ringel headstone in a different section of the cemetery. Joanne said yesterday that she doesn't think she saw the Wohlgemuth grave on her earlier visit. This explains our recent ignorance of the Betty Katz data on the headstone. I am wondering now what Elly and Helga knew about Betty's fate. Was Elly ever able to communicate with her mother after she and Helga arrived in America in April 1941? Did she learn of her mother's death at the time or at any time later? I don't believe Elly was ever able to visit the grave during her lifetime (she died in 1981). Though she traveled to Germany in the 60s and 70s, Weissensee was in East Berlin and she would probably not have obtained permission to go there. So she probably never saw the headstone. As to whether she could have been informed of Betty's death by the remaining Jewish community, that is an open question. If Elly did know what had happened to Betty, then Helga would have known too. Helga traveled to Berlin in the post-wall period and I'm pretty sure she visited the cemetery at the time. In her interviews with Walter near the end of her life, she gave the impression that she believed Betty died in a camp. So we are left uncertain for the moment about whether Elly and/or Helga knew of Betty's true fate, and thus whether our recent finds are true discoveries or perhaps a rediscovery of forgotten family history. That headstone has been standing there with Betty's information since 1942 but our generation just learned of it in August 2016. I just dizzy with joy. I was looking for the Wohlgemuth plot but the area was much overgrown. Then it just popped out suddenly, Isaak's stone and Betty there with him. She did not perish in a camp but is buried with her spouse, like mom and dad with a vertical stone. I guess we didn't find the Wohlgemuth stone the last time we visited, or else my memory is gone. Big rush now. Off to the Jewish Museum and then Shabbat services at Hermann's shul. Also have to clean the apartment and pack. I missed this when I posted about Margot yesterday. Her full name was Margueritte Shattner. OMG! Rosa Ringel is in the Names database, too. She is the mother of Ze'ev and Margot and Hermann's sister. She and Margot were both taken in Belgrade, where Rosa's deceased husband David Shattner had come from. I think they were likely living with their Shattner in-laws in Belgrade after fleeing Berlin. As with Margot, there are testimony forms submitted in Israel by Ze'ev and by Artur Hendel, a Shattner cousin. The forms are handwritten in Hebrew and German so I have not deciphered them. This photo was included with the Ze'ev form.